The pelican is one of those always-been-known birds. Unlike the osprey though, no single species of pelican is “cosmopolitan” (found worldwide), so before the Age of Exploration, Europeans were only aware of a few pelicans. In the mid-16th century, Conrad Gessner published a few pages on the pelican. This Latin is tough – my Google Translate skills were not up to snuff for this – but what I could gather is that there were two kinds of pelicans: “one of water that fishes” and one of land that eats snakes and worms. There is something about crocodile milk, I think, and I had no clue what to make of it, but here’s the link if anyone would like to try it out. There is also a list of medicinal uses of pelican body parts! Popular in these early modern zoologies are some bizarre stories. Unlike the osprey, the pelican has long been popular, frequently being tied to Jesus Christ, so I direct you to this informative Wikipedia article on the topic. 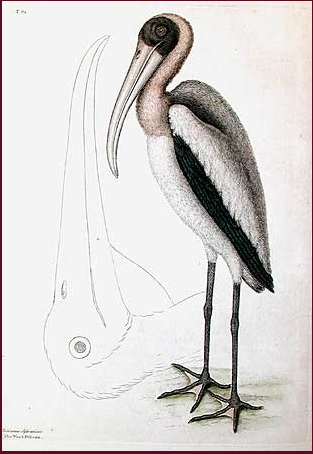 Mark Catesby, who explored the Carolinas and published a general natural history, thought he had identified a new species of pelican, by virtue of it sharing the pelican’s pouch under the bill (though it was smaller). Catesby called it the Wood Pelican (P. americanus). Apparently, this was a mistaken identification: instead, it is a stork. So who named the American White Pelican, Pelecanus erythrorhynchus, differentiating it from the Eurasian species, P. onocrotalus? Though Englishman John Latham was the first to identify the bird in 1785, he apparently did not see the need for rigorous Linnanean binomial nomenclature. Hence, he called it the “rough-billed pelican” and provided no scientific name. 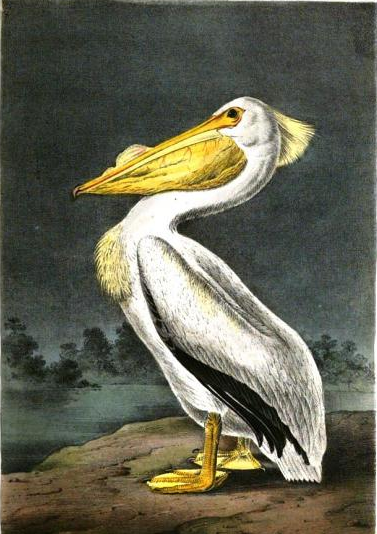 Just a few years later, realizing he needed to change his ways for the sake of credibility, he published Index Ornithologicus (of which I could not find a copy) in 1790, and, among other birds, he gave the new pelican a binomial name: P. trychorhynchus. However, as you might have noticed, that is not the pelican’s name today. Sadly for Latham, his conversion was two years too late. 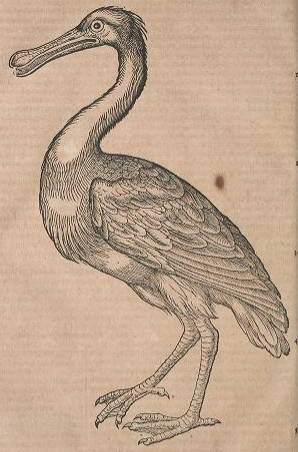 Johann Friedrich Gmelin published his own translation of Systema Naturae, and having Latham’s General Synopsis, named all of Latham’s new birds himself, including the pelican. Unfortunately, because of priority, this means the bird is named P. erythrorhynchus… for the red bill which it does not possess. The first “official” description of an American white pelican. It is a question with me whether this species should retain the name given by Gmelin; to the exclusion of the very pertinent “trachyrhynchus” Lath. The bill is not red at all, but yellow; and it is the P. fuscus whose bill is really red. The name thus conveys such an erroneous impression, as should justify its rejection. The synonymy of this species does not involve any particularly doubtful point; several of the old authors, such as Pennant, and indeed some of the latter ones, as Swainson and Nuttall, confound it with the European bird. The name erythrorhynchus given to it by Gmelin, although perhaps unfortunate, since the bill is not red, yet has priority over Latham’s more appropriate one of trachyrhynchus, and, consequently, must stand as the name for the species. The efforts made by some later writers to substitute Latham’s name for that of Gmelin’s cannot be countenanced; for it is contrary to the laws of priority, which is professed to be accepted as influencing the nomenclature of science; and if, simply because a name may be inappropriate, it is to give way to some other, then indeed a fine field is open for some other, then indeed a fine field is open for some one desirous of acquiring distinction in this line, as numerous names now accepted in ornithology could very properly be superseded by others. I feel great pleasure, good reader, in assuring you that our White Pelican, which has hitherto been considered the same as that found in Europe, is quite different. In consequence of this discovery, I have honored it with the name of my beloved country, over the mighty streams of which, may this splendid bird wander free and unmolested to the most distant times, as it has already done from the misty ages of unknown antiquity. While Audubon’s new name, Pelecanus americanus, is cited by later authors (by John Cassin, for example), it too loses the fight for priority. I have no clue as to why Audubon would not have been aware of the then 50-year-old name, erythrorhynchus. Did he not know Latin? From these facts, it may be concluded that the White Pelicans reach the Fur Countries of Hudson’s Bay by inland journeys, and mostly by passing along our great western rivers in the spring months, as they are also wont to do, though with less rapid movements, in autumn. The whole neck and the shores on both of the little bays were occupied by immense flocks of pelicans and gulls, disturbed now for the first time, probably, by the intrusion of man. They literally darkened the air as they rose upon the wing, and hovering over our heads, caused the surrounding rocks to reecho with their discordant screams. The ground was thickly strewn with their nests, of which there must have been some thousands. Numerous young, unfledged pelicans, were found in the nests on the ground, and hundreds half-grown, huddled together in groups near the water, while the old ones retired to a long line of sand-beach on the southern side of the bay, where they stood drawn up, like Prussian soldiers, in ranks three or four deep, for hours together, apparently without motion. . . We collected as many eggs as we could carry. That of the gull is of the size of a hen’s egg, brown and spotted; that of the pelican is white, and about as large as a goose egg. The pelican captured upon Gunnison’s Island was consigned to the kettle to-day, and boiled, for the purpose of preserving his skeleton. We had not been able to induce him to eat or drink a morsel, so that, finding he would starve to death, I had, a few days before, set him at liberty. He followed the boats for a long distance, but we lost sight of him, and the next morning he was found dead upon the shore. I had made some little progress in taming the fierceness of his nature. He would suffer me to assist him in pluming his feathers; but to all others he was sullen and intractable, snapping violently at every one who approached him. Sadly, what I have found does not tell me much about the pelican on the prairie, other than that ornithologists in the mid-19th century were aware of the huge bird’s preference for inland lakes and rivers, rather than the open seas. They also saw it as stupid and ugly, but at least Audubon recognized some of its majesty. The naming dispute exemplifies the rules of priority in the tradition of scientific naming, as well as the rise of Linnaean nomenclature. If I knew Latin, I could tease out more of its interesting emblematics and symbolism, but someone else will have to take care of that. I have to say: this is a well-written article on such a lovely creature. It helped a lot on my paper for school. Thank you and keep up the good work.